and steps. To do our shape we had to use a grid paper called isometric grid paper. After we got the hang of doing 3D shapes we then had to learn the different kinds of shading. Mrs Ferguson taught us how to shape lightly and very dark. 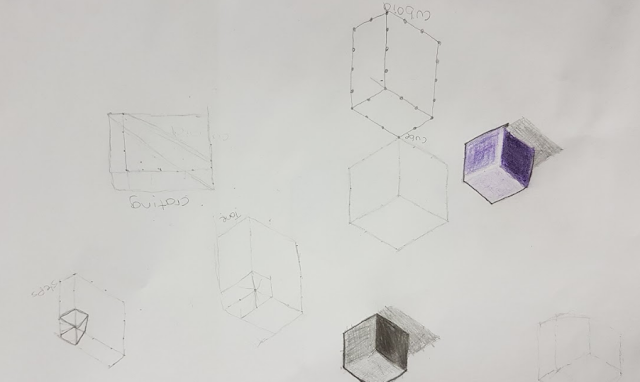 We had to challenge our self to shade in a cube with a normal pencil and a colouring pencil. The last task was to make a shadow for our cube we have created. The new word we learnt today were Shading, shadows, grid paper and 3D paper. Today was fun and I cant wait for next week. I like your drawings, they really do look 3D!